Editor’s Note: Oklahoma City is spread across a wide grid, and sometimes a gem of a service like Coffy’s Café gets lost amid the great number of caffeine options we have. We’ve dined at Coffys, been welcomed to the chill space, the records and even the piano, and we have enjoyed the original recipes. The café is having a fundraiser to help them stay in business, as they, like most small labor of love style shops, are having trouble breaking even. Saturday May 7th from noon to 10 pm Hudgens, Coffy, and the Plaza District community will be attempting just that. Attendees can expect live music, poetry, an hourly raffle that includes gift cards from local business, tattoo artists, private performances by musicians, commissioned art work, photography sessions, and much more. All the proceeds will go to Coffy’s Café. Check out: Coffy’s Café on Facebook. 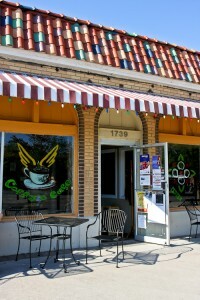 Get involved in the effort to “Help Save Coffy’s Café”. The reason I’m there is that a friend has told me about the café and the owner, Coffy, a.k.a Janice Francis-Smith. Prior to arriving, I’d been informed of the café’s eclectic record collection, but that’s not what jumps out at me the moment I cross the threshold. As soon as you walk into this café there’s an enclosed yoga studio off to one side. I’m not kidding. Suddenly I’m sensing the tagline is going to encapsulate my whole experience. As I wait for a chance to talk to Coffy, I wander around her café. There’s art on the walls, a lending library where Joy Behar and Dean Koontz are wedged next to the likes of Stephen Hawking and Mary Shelly; there’s a community board – I make note of a anonymous quote: “What would you attempt if you could not fail” – and take in the nifty décor. In the King Monkey Lounge, another little cozy nook in the café, a nice Washburn guitar is waiting to be played along with a well-kept Wurlitzer piano. I can’t help myself when I’m around unoccupied pianos, and I play a few pieces from memory, nothing fancy. I notice that sheet music rests atop the piano. There’s Bach’s Well-Tempered Clavier, 48 Preludes, and Fugues, and Frank Sinatra’s Anthology. It is then that I realize I haven’t even hit the record collection and I’m already enjoying this space. Add to that, this places not only sells local art, but also writers and musicians have displays where books and CDs are for sale. Try finding that at Starbucks. Eventually I wander over to the counter where Tracy Kimball, a recent hire at Coffy’s Café, is baking. While she’s rolling up cinnamon rolls, she tells me that the menu is completely gluten-free and vegetarian. Quiet frankly I’m amazed by the whole process. I don’t have a wheat allergy or Celiac’s disease so I don’t have cause to make gluten-free meals, but it looks nearly effortless as she makes the goodies from scratch. Kimball tells me she moved back to Oklahoma from Michigan. Before she started working at Coffy’s, she’d been the breakfast manger for Burger King. It was because of family ties and the recession, she decided to return to Oklahoma. 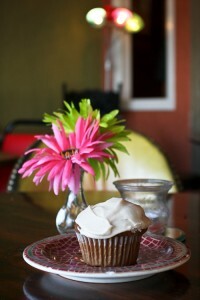 Kimball loves baking, and Coffy’s is a welcome change of pace. But she is a little concerned about the café’s future. She said the economy in Oklahoma seemed to be doing better than in Michigan, but according to the books lately, business has been slow at Coffy’s compared to the previous year. I try not to get in the way as she preps for lunch, and eventually I’m flipping through the albums as I wait. I find Bowie sandwiched next to The Dave Burbeck Quartet. And there’s a lot of The Dave Burbeck Quartet. I find Roberta Flack’s First Take next to Gershwin’s Rhapsody in Blue. There are so many choices – what to choose – Gil Scott-Heron’s Pieces of a Man or The Eagles The Long Run? I finally settle on The Flaming Lips At War with Mystics. I ask Kimball if it’s O.K. for me to play with the sound system. She’s says it’s cool and I drop the needle on “The Yeah, Yeah, Yeah Song.” I feel it’s relevant given the cafés uncertain situation and the effort to save it. And that’s really why I’m waiting around. I want to ask Coffy about her name, why she opened her own business, how things have been, and I want to know who all is responsible for the “Help Save Coffy’s Café” event set for May 7th. As we sit at a table, Coffy tells me she got her nickname from her Slam Poetry sessions. She originally worked as a journalist for many local news outlets before landing a job at The Journal Record. She said two years ago in 2009, with nothing but blind optimism and money from savings and her 401 K, she quit her job as a journalist on the capital beat, and opened the café with her sister, Denise Francis. Her sister later moved, but it was a combination of her sister’s love of baking and a mutual friend’s diagnosis of Celiac’s disease that lead the sisters to develop their gluten-free recipes. It’s clear they thought about what they wanted and went after it. When I ask about the anonymous quote from earlier, “What would you attempt if you could not fail,” Coffy laughs and says it was one of the first items posted in the café. And really the story of how this place came together fits the quote. The piano was a lucky find. A church down the street happened to be selling it. Her husband, Kirk Smith, is handy. He built the partitions, tables, and shelves for her. He’s also responsible for the tea selection, while she’s the one who selects the coffee. She said she likes Prima Café and hopes to eventually have the roaster make a signature blend that carries her label. Even friends and acquaintances got in on the process by contributing records, labor, and décor. In turn, Coffy’s became a collective space for people to enjoy. With an eye for inclusiveness, all kinds of people have been welcome. The yoga studio has an instructor who takes donations for sessions. Coffy said if someone didn’t have money one week for a class, then they’d bring some the following week. People are giving and supportive. Poetry groups congregate here, as do musicians. She said that it isn’t unusual for someone to pick up the guitar, sit out in front of the café, and play. In the afternoons it’s not unusual to see middle school and high school aged kids come hang out. But the last few months have been difficult. Coffy found that she was making just under what she needed to stay solvent as business. 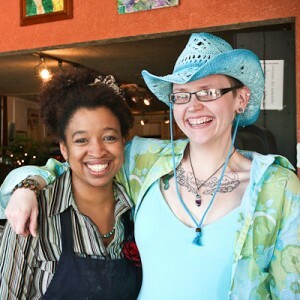 A regular patron of the café and friend, Jennifer Hudgens, heard the same news from Coffy. It was then that Hudgens told Coffy she would not let the café go down without a fight. But to understand this declaration, you have to know that Hudgens and Coffy go back four years. At that time Hudgens was coming back to open mic poetry and Coffy was supportive, as Hudgens puts it, “instrumental.” So when Coffy opened her café, Hudgens was happy to have a place to write and organize poetry sessions. So with a mission in mind, Hudgens quickly organized “Help Save Coffy’s Café.” Coffy said Hudgens went to work typing away at her netbook, and within an hour had set up the event, attracted donations, and scheduled five performances. As for Hudgens it is a matter of raising awareness and support. 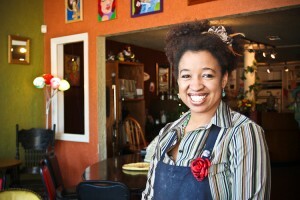 When people heard that Coffy’s Café might close, she said the community rallied. Tagged books, Burger King, community, Dean Koontz, Gil Scott Heron, Help Save Coffy, Jennifer Hudgens, music, Oklahoma City, options, Plaza District, poetry, Roberta Flack, space. Bookmark the permalink.